The Vista Remote2 KVR-1R4UA/OV/2 is a versatile, powerful, and economical 4-port IP KVM that extends the range of access to your computers and servers to anywhere in the world. Its advanced design makes it compatible with most computers. The KVR-1R4UA/OV/2 is the KVM switch of choice for desktop, small office, or home use. You can connect a local KVM station to four computers, while remote users can connect to the Vista Remote2 using the very secure RealVNC remote application via any internet browser. Once connected and authorized, the remote user has complete control over the connected computer. The KVR-1R4UA/OV/2 consists of an IP input module and a KVM switch module. The IP input module controls all remote access and security to the unit and the KVM switch module manages the connected computers. The Vista Remote 2 is designed with the highest regard for security. Remote access requires a user ID and password. All transmissions to and from a remote user are encrypted with the latest AES 128 bit encryption technology. Up to 16 user accounts can be set-up, each with separate access permission levels. The KVM switch module can add additional security features with configuration and access ID and passwords. The Vista Remote2 family of IP KVM is easy to install and configure. 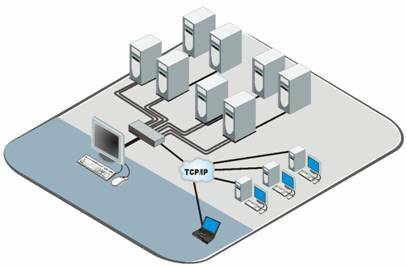 Assign an IP address and network information, configure the CPU ports to accommodate the connected computers, connect the unit to the network and its ready to use. Remote users are set-up with a unique user name and password. Access permissions can be set from full access to the configuration menus and computers to limited access to just the computers. The IP input module and the Switch module's OSD provide an easy method for configuring, selecting and switching among the connected computers. Connect to your computers locally, remotely over your network, or over the web using any supported web browser or VNC viewer. Question: Does this unit support PS/2 keyboard and mouse ? And can we get picture of the back where the connections are. The keyboard and mouse connections on the Rose KVR-1R4UA-OV-2 are PS/2. I have updated the product page with an image of the rear of the unit, which you can also find here.